While holiday decorations are popping up all over on people's houses this season, they are not the only glittering spectacles to be seen: For the ultimate Christmas lights, all you have to do is look up, where some constellations promise to dazzle on clear nights. This December 2010 sky map depicts a view of some of the constellations visible in winter in the Northern Hemisphere. These days, streets, homes and stores are festooned with evergreens and arrayed in bright lights. As a kid growing up in the Throggs Neck section of the Bronx, I can vividly remember one particular house in our neighborhood. Every year, it was transformed into a twinkling winter wonderland featuring dozens of dazzling festive displays. The entire front lawn was transformed into a veritable galaxy of lights. So spectacular was this display that people would come from miles around just to see what became known simply as "The House." Yet, whenever I passed by this scene, I looked not so much at The House, as I did at some of the other homes that immediately flanked it on either side. I always felt kind of sorry for them because, while they were adorned with their own pretty holiday decorations, none could match the head-turning array provided by The House. My childhood memory can also serve as the perfect analogy for the current evening sky — since at this festive time of year, nature too seems to decorate the sky with bright stars. And to be sure, if there is one constellation that could serve as the celestial version of The House, it's Orion, the Mighty Hunter - one of the most famous constellations in the Northern Hemisphere's Winter sky. Indeed, everyone's attention is always immediately drawn to Orion with its retinue of bright stars, its famous three-star belt and great gaseous nebula (M42), known to be a stellar incubator for new stars. Just to the south of Orion is a group of faint stars that seem to be arranged in the shape of a bow tie: Lepus, the hare. It is placed far from Corvus, the crow, or Aquila, the eagle, who are both deemed hare predators. A number of early peoples associated the Hare with the moon. However, to the Arabs, the four brightest stars of Lepus, arranged in a crude rectangle, represented four camels quenching their thirst. According to star-name expert George A. Davis Jr., the name of one of these stars, Nihal, means just that. Lepus'sbrightest star is called Arneb, an older, dying star that may have already passed through a supergiant phase and is now contracting and heating up in the latter phases of stellar evolution, or perhaps is still expanding into the supergiant phase. With a mass about 10 times that of the sun, it is expected to end its life as a hot white dwarf, although if it's heavier than estimates indicate, it may end in a spectacular stellar explosion known as a supernova. Gamma Leporis is a comfortable binary star to view in a small telescope. About two magnitudes separate their brightness. Put your instrument slightly out of focus to spread the light onto your retina's cones in order to appreciate the pair's colors. Color perception, like beauty, is in the eye of the beholder, thus accounting for different descriptions: Most will say the stars look "yellow and garnet," or "yellow and orange." Very few stars are ever called green, but some observers see one of these as a bit grassy. Based upon its stellar characteristics and distance from Earth, Gamma Leporis is considered a high-priority target for NASA's Terrestrial Planet Finder mission, a proposed telescope to search for alien planets beyond the solar system. One interesting variable star is labeled R. It is often placed in the same class as Mira Ceti, the so-called Wonderful Star, because it has an irregular period of roughly 432 days. The astronomer J.R. Hind of London first noted it in October 1845 and described it as "resembling a blood drop on the background of the sky." 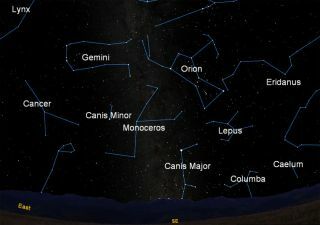 Below Lepus, we find Columba, a star pattern not among the original 48 constellations usually attributed to the ancients. Its origin is uncertain, but in most of the older star atlases it appears as a dove holding an olive branch in its beak. Columba represents the dove that Noah sent forth after the flood to search for land, hence its original Latin name "Columba Noachii." The dove flies below Lepus and within its boundaries is the place from which the sun is moving, the "antapex of the sun's way." In 1718, Sir Edmond Halley determined that the stars were not fixed, but moved across the sky in what we call their proper motion. In our winter sky, the sun's path in space is taking us away from Columba at about 12.5 miles per second with respect to other nearby stars. Jason's Barge ... or Noah's Ark? It may also be possible to pick out a few of the northern stars of the now-defunct constellation Argo Navis. In mythology, this was the ship used by Jason in his quest for the Golden Fleece. This very large star group lies mostly below our southern horizon, but a few of the ship's higher structures jut up above our southern horizon. In fact, the great star Canopus is located in Carina (the ship's keel) almost directly south of Sirius. Second in splendor only to Sirius itself, it's situated at a distance of 310 light years from us. Placed side by side, Canopus would appear 575 times as bright as Sirius; on equal terms it would outshine our own sun as much as twelve thousand times. This is a mighty sun that currently sparkles near the southern horizon in the after-midnight hours for those who live across the lower half of the contiguous United States. Three faint stars to the east of Puppis make up Pyxis, the compass, which also contains T Pyxidis, a cataclysmic variable star also called a recurrent nova. On five occasions (1890, 1902, 1920, 1944 and 1967) this star brightened dramatically; astronomers think it's long overdue to "pop" again. Below Pyxis is Vela, the sail, whose brightest star Suhail is a splendid double star, resolvable in a good pair of binoculars – although unfortunately, it's extremely low in our sky. The primary belongs to a special class called "Wolf-Rayet" stars. It is an extremely hot and giant luminous star about 3,900 times brighter than the sun and 520 light years away. The Great Ship Argo was sometimes associated with Noah's Ark, which actually makes perfect sense with Columba nearby, suggesting that it may indeed be the dove of Noah!